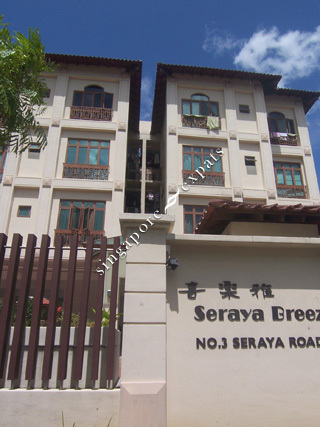 SERAYA BREEZE is located at 3 SERAYA ROAD in district 15 (Katong, Siglap, Tanjong Rhu) of Singapore. SERAYA BREEZE is a Freehold Condo development. SERAYA BREEZE is completed / TOP in 2001 (estimated). Educational institutions like CHATSWORTH INTERNATIONAL SCHOOL (EAST), CANADIAN INTERNATIONAL SCHOOL (TANJONG KATONG), ETONHOUSE INTERNATIONAL SCHOOL, TANJONG KATONG PRIMARY SCHOOL, HAIG GIRLS' SCHOOL and CHIJ (KATONG) PRIMARY are near to SERAYA BREEZE. SERAYA BREEZE is accessible via nearby DAKOTA, PAYA LEBAR and EUNOS MRT Stations. District 15 (Katong) is one of the top premier districts in Singapore. Katong is a residential area in the east of Singapore near the seafront. It is a suburb of great prestige and possesses special historical charm for its Asian heritage and seaside town charm.